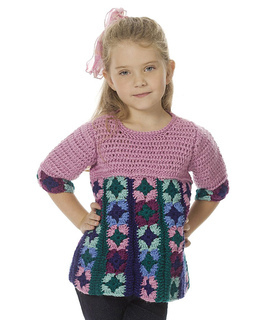 Kids apparel can be loads of fun to crochet. 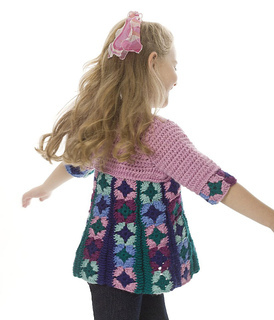 Ann E. Smith’s Just Plain Fun Child’s Top combines mini-granny squares with a sweet little-girl bodice that looks totally fun to wear. 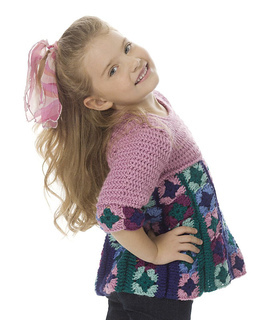 (Our model couldn’t stop twirling…) Make this darling little top and and show a little girl just how much fun crochet can be! Some colors in original pattern have been discontinued. 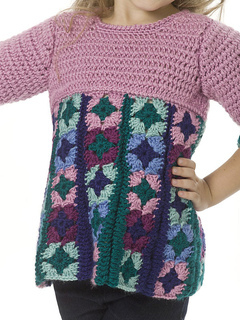 The skirt is made from 8 (10, 10, 12, 12) strips of granny squares. Each strip consists of 4 (5, 5, 6, 6) granny squares. Each granny square is made using two colors, and is joined to previous granny squares using a “join as you go” technique.